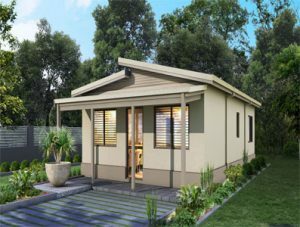 Traditionally granny flats have been thought of as small houses that need to be hidden away in the backyard where nobody can see them; it is quite rare for you to find one located towards the front of the property as a feature of the main house. Granny flat designs with attractive elevations and features such as skillion roofs or feature renders shouldn’t have to be hidden away from the public where nobody gets to appreciate their beauty other than the owner. Changes to legislation in WA back in 2013 means that property owners can now build granny flats for the purpose of gaining rental income! These changes saw a huge spike in sales of granny flats Perth as property owners and investors were extremely keen to take advantage of the opportunity to boost their income. The new regulations now allow Granny flats to be built in all residential areas providing there are no more than one main home and one granny flat on the same block of land, but there is a limit to the amount of floor space the granny flat can have and this can vary from one council to another. It is recommended that you contact your council for the most accurate information. If you’ve been thinking about having a granny flat built on your property, it could be worth considering whether locating the building at the front of your property next to the main home would help to increase the overall value. There is also the option to have a granny flat attached or semi-attached to the main home, making the main home appear much larger or more spacious. There is no doubt that having this extra accommodation on your land will boost the value of your biggest assets, but the way you position it on your land can also impact its value and you should definitely take into account the best placing to complement the main house. Did you know that Great Living Homes in Perth build double storey Granny flat designs? These are ideal for property owners with magnificent views as the upper floor can be designed with a balcony for you to take in the scenery or relax with a few drinks. Some granny flats can also have lockup garages or carports as an added benefit, and you can choose how many bedrooms you want as long as the amount of floor space doesn’t exceed council guidelines. Is it time for you to invest in your future by increasing your property portfolio and rental income? Or maybe you have elderly parents to accommodate, teenagers that need a little more freedom or even a home business that requires a little more space and an office for clients to visit? Whatever the reason, granny flats have so many uses it’s almost silly not to have one in your yard!